When you’re working on aircraft, it’s often not enough to securely bolt materials together, not when these materials will be subjected to the vibrations and stresses of flight. That’s where lockwire comes in, and that’s where Jaco Aerospace comes in. We are one of the largest distributors of lockwire worldwide, and we have an extensive inventory of safety wire of all materials and sizes. Buying lockwire from us online is simple. Just choose the material you want from stainless steel, titanium, copper, brass, nickel, or alloys of the above. Select the diameter you need, and place your order to get our high-quality lockwire delivered as soon as tomorrow! Using this safety wire to secure bolts is simple, too. In just a few minutes, you can learn the technique to lock wire around bolts so that when they try to come loose, the wire will counteract this force, securing them as firmly as a lock. Wire used in this way makes aircraft safer, and when you buy lockwire from Jaco Aerospace, you’ll be protecting your bottom line, too, thanks to our low prices. All of our lockwire products are individually labeled with the wire diameter, specifications, type of material, and lot number to provide for easy identification and complete traceability of the wire. Custom labeling for 50 pounds or more of lockwire is available at no extra charge. 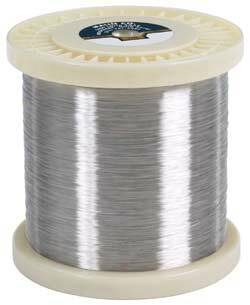 Lockwire is also available in one-pound canisters and five- or ten-pound spools. And no matter which product you choose, all orders come with a Certificate of Conformance as well as support from our expert staff. Not sure which lockwire product would best meet your aviation needs? Just contact us online or by phone and let us walk you through our selection of commercial and industrial lockwire for sale. While you’re at it, take a look at all of the other airplane materials and supplies that we carry to stock up on anything else you might require and take advantage of our great prices and super-fast shipping. If you can use it to build or maintain aircraft, chances are good that we can get it for you!